You probably desire a flat and toned midsection. Unfortunately, your belly is an area on your body that is difficult to burn fat off. Excess belly fat can increase your risk of developing heart disease and other grave medical conditions. The preeminent way to reduce your waistline is to adhere to a strict diet that incorporates nutritious quantities of carbohydrates, fats and proteins. Eating certain foods can help you get rid of belly fat naturally. A calorie is a unit of energy. Your body demands calories to function properly. Calories derive from the food and drinks you consume. If you don’t manage to shed excess calories by being active they can transform into hazardous fat and promote weight gain. Much of this fat will ultimately be stored in your belly. Fats are also essential for your body. Fats, which are correlated with substances called lipids, are organic compounds consisting of carbon, hydrogen and oxygen. There are saturated and unsaturated fatty acids. Saturated fats are bad for your health because they elevate LDL levels or detrimental forms of cholesterol. On the contrary, unsaturated fats are beneficial because they decrease cholesterol levels. Eating excessive amounts of saturated fats is unhealthy and can increase the size of your belly. You should maintain a diet that concentrates on low-calorie, nutrient-dense foods like whole grains, vegetables and fruits to get rid of your belly. Grapefruits, pears and apples are fruits that can help you flatten your middle torso. Grapefruits are rich in vitamin C and they can lower insulin levels in your body. Increased insulin levels force your body to grasp onto fat and store it. Grapefruits are also rich in fiber. Foods plentiful with fiber make your body burn additional calories. FitnessTipsForLife.com cites a 12-week study conducted by researchers at Scripps Clinic that found participants who ate half a grapefruit with each meal lost an average of 3.6 lb. 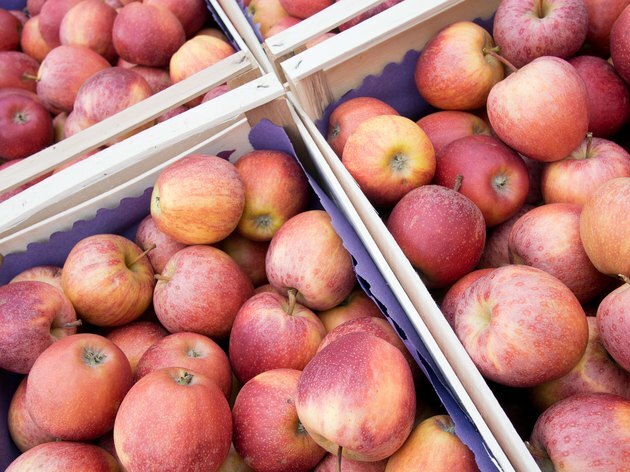 Apples and pears are low-calorie fruits that are also high in fiber. Hence, your body is required to burn calories to break down the fruits. Workers from State University of Rio de Janeiro discovered overweight women who consumed three apples or pears per day lost more blubber than women who didn’t regularly ingest these fruits. Broccoli should become a staple in your diet to remove belly fat. Broccoli efficiently boosts your metabolism because it is packed with calcium and vitamin C. Eating broccoli is particularly effective because calcium is correlated with weight loss and it elicits your metabolism into action. Vitamin C meanwhile assists the absorption of chemical elements. Oatmeal is a whole grain that is comprised of nourishing carbohydrates and fat-soluble fiber that combat elevated cholesterol levels. The fiber found in oatmeal also lessens insulin levels and amplifies your body’s metabolism rate. How Do Women Get Rid of Belly Fat?